Śrīla Bhakti Sundar Govinda Dev-Goswāmī Mahārāj’s poem describing the descending grace of Śrī Guru and Śri Gaurāṅga. on Thursday 13 October 1960. The embodiment of the inconceivable rasa that the great souls and the scriptures—the Vedas, Tantras, Purāṇas, and so on—search for, Śrī Govindasundar, has been revealed in the world by Śrī Gītā, Śrīmad Bhāgavatam, and other scriptures. This embodiment of the highest rasa is manifest by His own eternal energy to distribute and taste Himself. When He is manifest in the form of Śrī Śrī Rādhā-Govinda, His unprecendented Pastimes are attained by loving devotion. When They desire to personally distribute the inconceivable supreme rasa, which is hidden by the Vedas, Śrī Śrī Rādhā-Govinda assume one form and become unprecedentedly beautiful as Śrī Gaurasundar. Nabadwīp, the seat of knowledge, is the supreme abode. There, Kṛṣṇa’s Name and divine love for Kṛṣṇa shine atop the head of knowledge, and, mad with joy, Śrī Śrī Rādhā-Govinda chant the Name of Kṛṣṇa. All of this came with the appearance of Śrīman Mahāprabhu. Roaring, Śrīman Mahāprabhu empties the storehouse of the nectar of His own supreme divine love and relishes it. As though mad, He laughs, cries, dances, sings, and runs in all directions distributing the wealth of divine love. He gives outcasts a gift that is difficult for the gods to attain. He makes divine love easily attainable to even animals, birds, grass, and shrubs. The unfortunate were deceived during His descent, but He, as an ocean of unconditional mercy, cannot tolerate this. So, from place to place and time to time, He sends His personal expansions and distributes the liquer of divine love for Kṛṣṇa. Still today, Śrī Gorā Rāya performs such Pastimes, and fortunate souls roll in the dust of His feet. In the form of Śrī Guru, Gaura Kṛṣṇa pierces through the illusory environment and reveals Himself to eyes and hearts that are anointed with the collyrium of faith. His eternal, playful form and His Pastimes of tasting rasa manifest within pure hearts—within consciousness that is filled with divine love. The scriptures say: “As you serve the Lord, so you should serve Śrī Guru (Śu: 6.23)”, “Śrī Guru is your Lord and beloved (SB: 11.2.37)” Śrī Guru is your beloved and Lord (SB: 11.3.22)”, and “The Supreme Soul is not attained by reasoning, intelligence, or extensive learning; He is attained by one whom He chooses; He reveals His form only to them (Ku: 1.2.23)”. If we disregard this conception of Kṛṣṇa and Guru, then, as a result of pettiness and envy, we think the divine (Śrī Guru) to be mortal. “The scriptures confirm that Guru is a form of Kṛṣṇa. In the form of Guru, Kṛṣṇa bestows His mercy upon the devotees (Cc: Ādi, 1.45).” One who is in truth decorated with the characteristics of a genuine Guru is nondifferent from the Truth, and Kṛṣṇa performs Pastimes in their body. According to external vision, a genuine Guru engages in material affairs, but at heart Śrī Guru acts only for Kṛṣṇa’s sake and offers everything to Kṛṣṇa. Śrī Guru is the bridge from the earth to the Lord’s abode. He is the miraculous embodiment of the deliverance of the fallen souls. While wandering throughout the universe, some good fortune brought me to the feet of a devotee of Śrī Gaura. Hearing the glories of Gaura Kṛṣṇa from them soothed my heart, and my heart was moved by the purport of those glories. Although it was worn and torn by disease, suffering, lamentation, and misery, my heart got a taste of Śrī Kṛṣṇa’s inconceivable Pastimes. Now, I progress gradually by Śrī Guru’s mercy, but Māyā Devī hurls many obstacles at my head. At first sight, these obstacles are extremely difficult to bear, but from an expanded angle of vision, they are forms of good fortune. Gradually, all of Māyā’s snares break apart, and ultimately they give me opportunities to serve Śrī Kṛṣṇa. The Guru by whose mercy very poor and fallen souls attain the wealth of divine love for Kṛṣṇa, which is difficult to attain even for Brahmā and the other gods—I hear from the mouths of the sādhus that the earth received the touch of this Guru’s feet on the ninth day of the month of Kārtik. In 1817 of the Śaka era, on Saturday the 26th day of the solar month of Ashvin, the ninth day of the dark fortnight in the lunar month of Dāmodar calculated from the first day of the waning moon, in the middle of the night during conjunction with the Puṣyā star, he appeared on the earth (on 12 October 1895). I offer my obeisance to this auspicious year, month, fortnight, lunar day, solar day, night, star, and moment again and again. According to the conception of the great souls, this moment occurred on the earth today, on this auspicious day. Gathering at this auspicious moment, many fortunate souls are worshipping the feet of Śrī Guru with pure hearts. Remaining behind them, I also worship his feet. In life and in death, let his feet be my wealth. His lofty divine form, his divine limbs, his eyes illumined with divine knowledge, his divine perception, his divine language, his divine mood, his divine lustre, and his merciful divine figure remain in my heart forever. 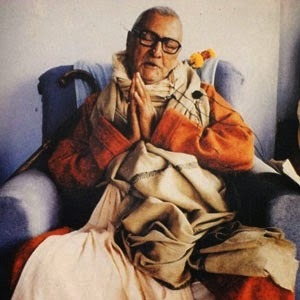 Grave, brilliant, sincere, and magnanimous, a thunderbolt atop the mountain of mundane knowledge, a conduit for divine revelation, cordial and affectionate to the good and unconquerable by the bad, Śrī Guru’s form as the follower of Śrī Gaura always remains in my heart. He is revered in the assembly of Gauḍīya Āchāryas, and the jewel-like precepts given by the Gauḍīya school are the bright ornaments around his neck. In his conception are the truths within all worldviews, and he harmonises everything with the axiom of inconceivable difference and nondifference. He is a mine of the precepts revealed by Śrī Gaura, and the wish-fulfilling jewels of the meanings of these precepts are discovered by his words. He feels ever-new joy in describing the Absolute, and his strengths are adjustment and harmony. Unanimously, all his godbrothers see within him revelation of the precepts taught by their Guru. Seeing him chant the Holy Name with tulasī beads in his hand, they are reminded of Śrīla Prabhupād (Śrīla Bhakti Siddhānta Saraswatī Ṭhākur). “Although Rāmachandra is nondifferent from Nārāyaṇ, the feet of Rāmachandra are everything to me.” Holding this statement of Hanumān on my head, in life and in death, I desire to be in the boat of his feet.